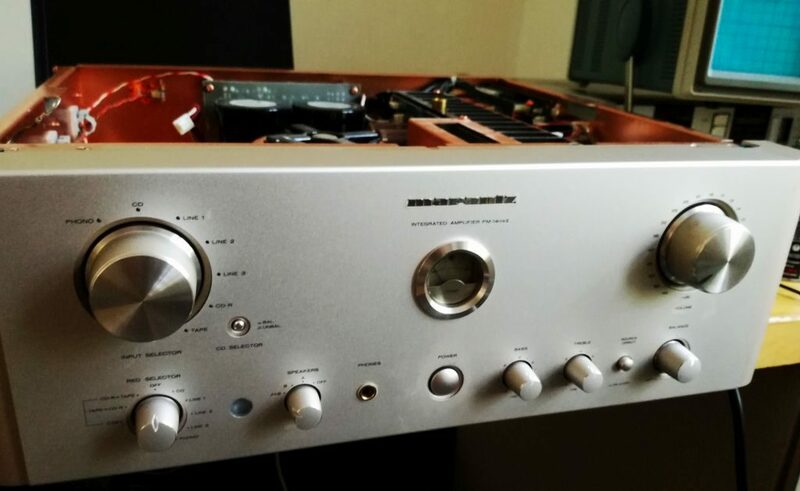 A heavy beauty, a Marantz Amplifier, PM-14. Certainly worth a detail look – according to the owner, the left channel is not working, and some smoke escaped along with burned smell. No wonder – the two main transistors of the left channel are blown, say, exploded. And, upon further inspection, also the traces leading to the transistors, at least some of the traces – evaporated. 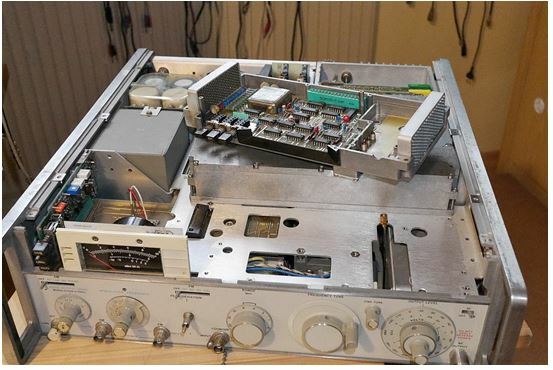 This is the full view of the left channel amp (right channel is quite similar, but mirror image – some components placed at slightly different positions. 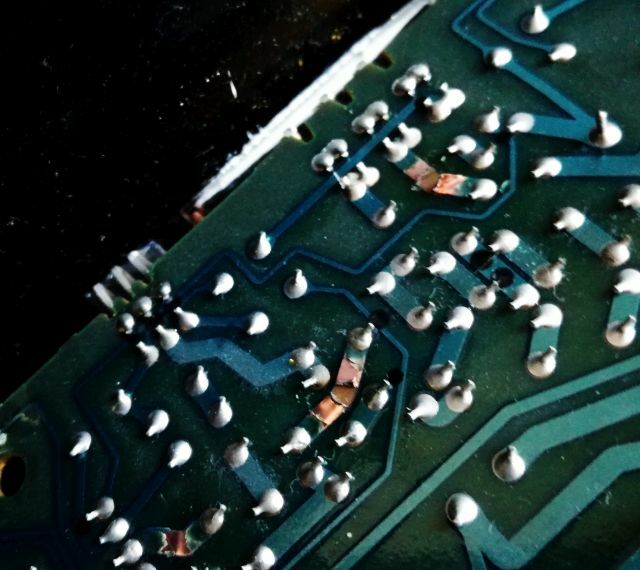 The board is double sided, but not through-plated, and the quality, well, is not all that good – needs to be soldered with care, otherwise the traces will lift. After some further checks, fitted a new set of transistors (ISC brand, China – still better than some fake “Sanken” transistors), but to the biggest disappointment, when switching on, these exploded in a loud BANG when adjusting the idle current. 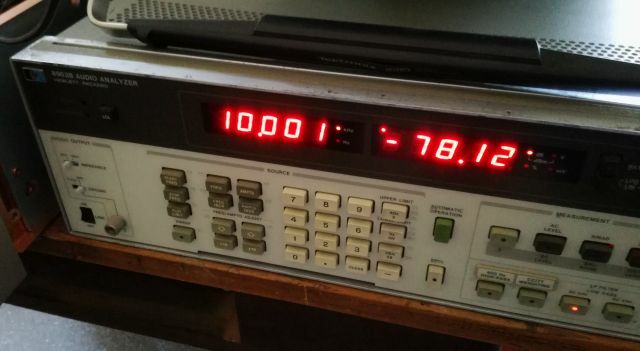 Well, turns out that also one of the earlier stages had a short transistor 2SA1145. More testing revealed another defect, a dead Zener (exchanged both Zener, to make sure that there are no issues with temperature drifts etc.). 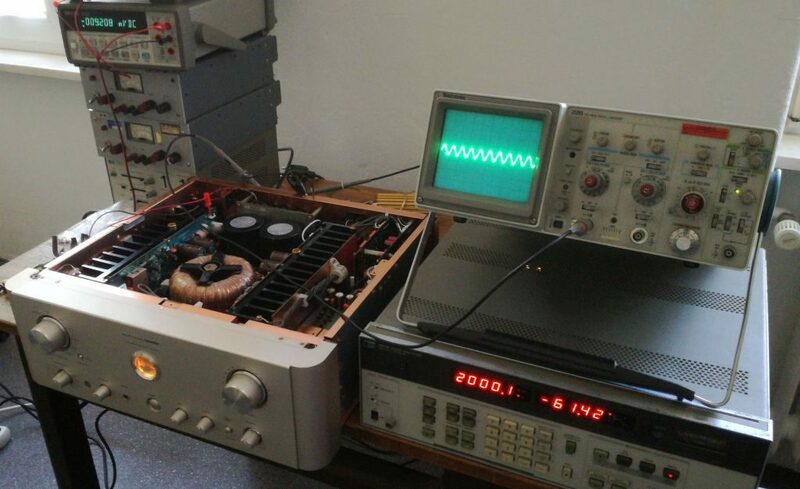 With all these things fixed, time for a test, using a HP 8903A, and a scope. 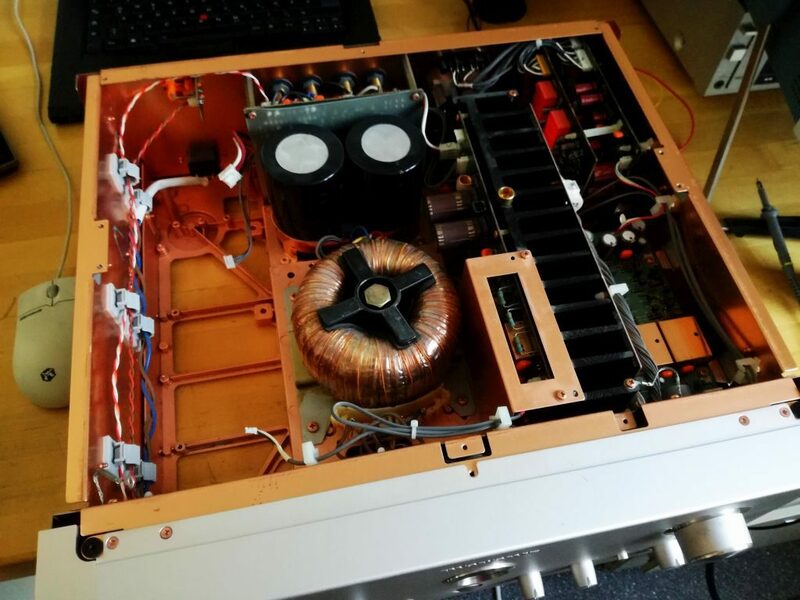 The HP 8903A is really handy, if your are into any quality audio repairs. 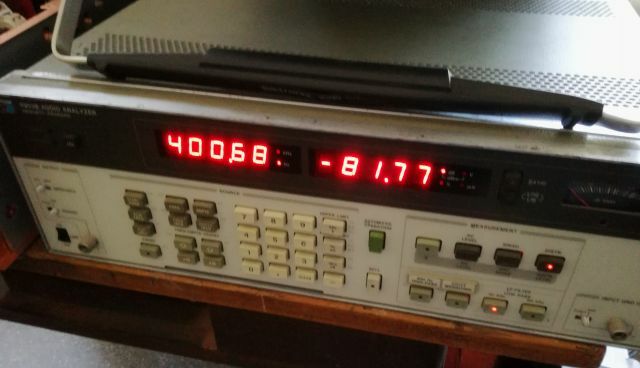 Distortion measured at several frequencies, and several volts RMS at the output (using a 5.6 Ohm dummy load – just because I didn’t want to take out the 4 Ohm precision load for these power levels). -80 dB total harmonic distortion+noise, not bad. 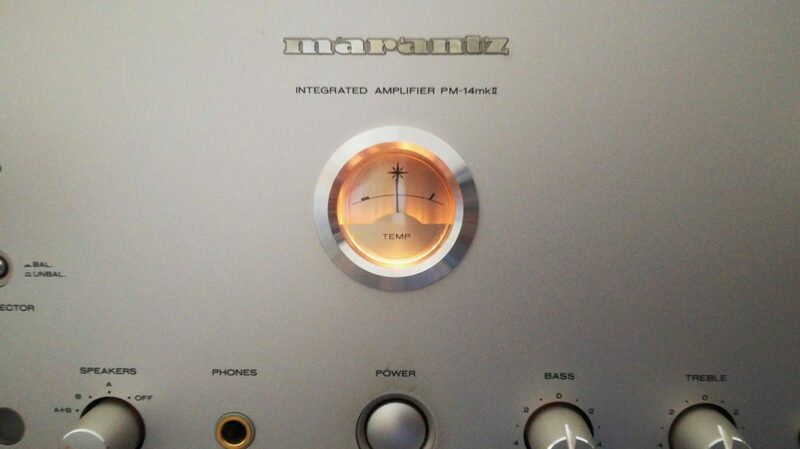 The front view – it has the classic Marantz indicator, for best sound, wait until it has warmed up. 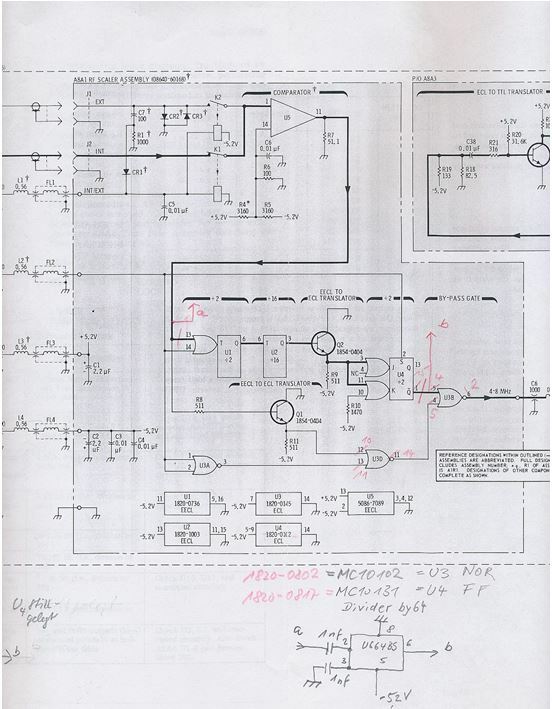 As a reference, just in case you need it, the service manual Marantz PM-14 Service Manual. Or, just send me a message, or the come along with your dead amplifier. The veritable 8640B generator, a marvel of engineering and still remarkable design today, it has reached an age where repair is often hampered by obsolete parts – sure, you can search for a donor unit or some NOS parts in some far away places, but in other cases, it is more practical to replace the circuitry with some new parts, especially, if the circuit is easily tested and verified. 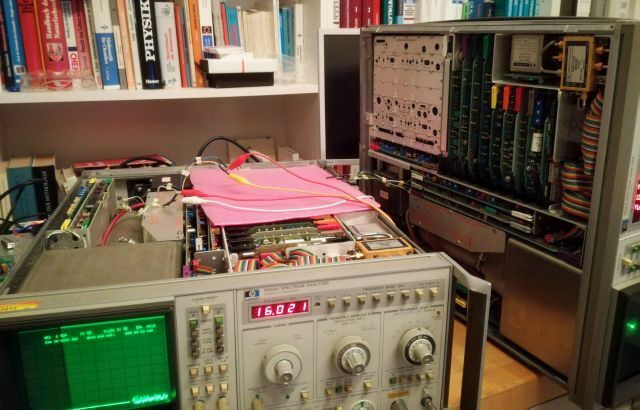 This applies to the pre-scaler/frequency counter, which is an essential part of the 8640B, at least, if you want to use its internal counter (the 8640B is not PLL controlled). (1) Symptom: the 8640B showed irregular frequency counts, completely unrelated to the expected output frequency. First consideration was a defective band switch (which has a cracked Delrin gear), but test with a spectrum analyzer revealed a perfectly good signal. 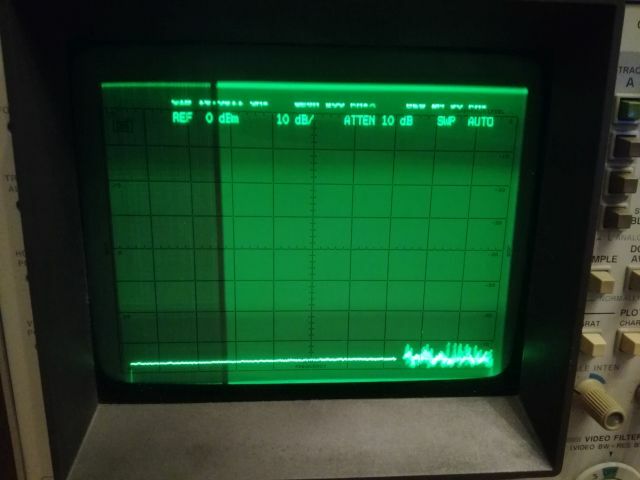 Connecting a 0-10 MHz signal to the external counter input also gave perfectly good counting. 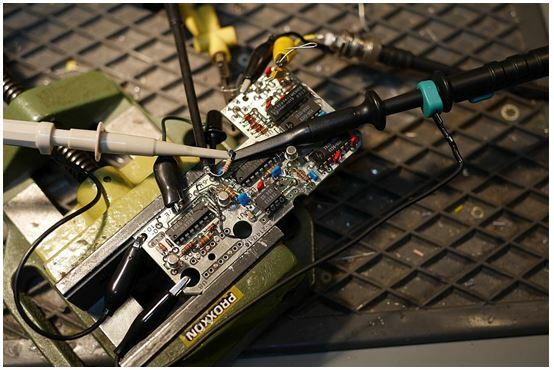 (2) After study of the schematic, the issue could be traced to the RF scaler, which is located in a die-cast cavity. Note that there are various versions of this board, but all feature some ECL logic ICs, with high power consumption. (3) Further tests showed that the first divider, :2 was defective. (4) There are several ways to fix this. Here, the complete divider chain was replaced by a U644BS, available in DIP8. 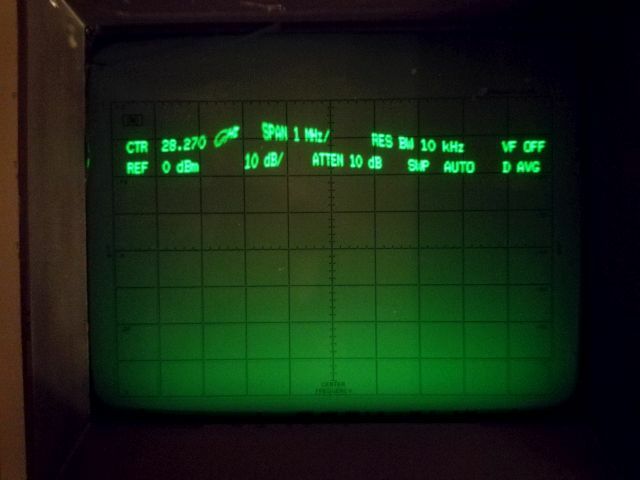 This IC is quite common in old TV tuners. There were also several projects in popular electronics magazines of the 90s to use the U664 as a pre-scaler up to 1.3 GHz. With the external input, the 8640B is counting up to 900MHz, sensitivity is better than -25dBm. Note that the U866BS is self-oscillating (not a problem, because the 8640B oscillator is permanently attached for internal counting). One side effect is the much lower temperature of the RF scaler (much lower power consumption of the U664BS vs. the old ECL logic). Finally, this is the schematic, the signal is connected from a-INPUT to b-OUTPUT.